The middle class is being systematically wiped out of existence in the United States today. America is a nation with a very tiny elite that is rapidly becoming increasingly wealthy while everyone else is becoming poorer. So why is this happening? Well, it is actually very simple. Our institutions are designed to concentrate wealth in the hands of a very limited number of people. Throughout human history, almost all societies that have had a big centralized government have also had a very high concentration of wealth in the hands of the elite. Throughout human history, almost all societies that have allowed big business or big corporations to dominate the economy have also had a very high concentration of wealth in the hands of the elite. Well, the United States has allowed both big government and big corporations to grow wildly out of control. Those were huge mistakes. Our founding fathers attempted to establish a nation where the federal government would be greatly limited and where corporations would be greatly restricted. Unfortunately, we have turned our backs on those principles and now we are paying the price. When you have great concentrations of wealth and power, the economic rewards of a society tend to go to just a few. In the United States today, big businesses and wealthy individuals fund the campaigns of our politicians, and in turn our politicians pass laws which rig the game in their favor. It is a symbiotic relationship which is very bad for America. Sadly, most conservatives tend to cheer on the big corporations, but this is not how our founding fathers envisioned our capitalist system working. Our founding fathers envisioned large numbers of similar companies competing against one another for customers. They did not envision a very small number of giant corporations buying up all of their competitors or smashing them into oblivion with their giant piles of money. True conservatives should want to see more competition instead of less competition. Competition helped make America great, and we need to get back to that. Instead of an economic landscape dominated by monolithic predator corporations, we need an economic environment where millions of small businesses can thrive and compete directly with one another. Our founding fathers never intended for us to have the kind of system that we have today. As I have discussed in previous articles, our founding fathers greatly restricted the size and scope of corporations in early America. The following is how author Stephen D. Foster Jr. described the attitude toward corporations in the early years of the United States…. The East India Company was the largest corporation of its day and its dominance of trade angered the colonists so much, that they dumped the tea products it had on a ship into Boston Harbor which today is universally known as the Boston Tea Party. At the time, in Britain, large corporations funded elections generously and its stock was owned by nearly everyone in parliament. The founding fathers did not think much of these corporations that had great wealth and great influence in government. And that is precisely why they put restrictions upon them after the government was organized under the Constitution. After the nation’s founding, corporations were granted charters by the state as they are today. Unlike today, however, corporations were only permitted to exist 20 or 30 years and could only deal in one commodity, could not hold stock in other companies, and their property holdings were limited to what they needed to accomplish their business goals. And perhaps the most important facet of all this is that most states in the early days of the nation had laws on the books that made any political contribution by corporations a criminal offense. A giant central government that spends more than 20 percent of our GDP is a collectivist institution. Enormous predator corporations that are constantly sucking up even more money and power are collectivist institutions. Our founding fathers did not intend for our society to be dominated by collectivist institutions. Very large institutions tend to reward the people that own and run them at the expense of everyone else. A lot of these giant corporations have figured out that they don’t even need American workers anymore. Instead, many of them are shipping our jobs to the other side of the world where it it legal to pay slave labor wages. That means bigger profits for them but less jobs for the rest of us. In America today, the rich are getting richer and the poor are getting poorer, and big government and big corporations are the mechanisms by which this is happening. Posted below are 45 signs that America will soon be a nation with a very tiny elite and the rest of us will be poor…. #1 Increasingly, gains in income are becoming very highly concentrated at the top of the food chain in America. 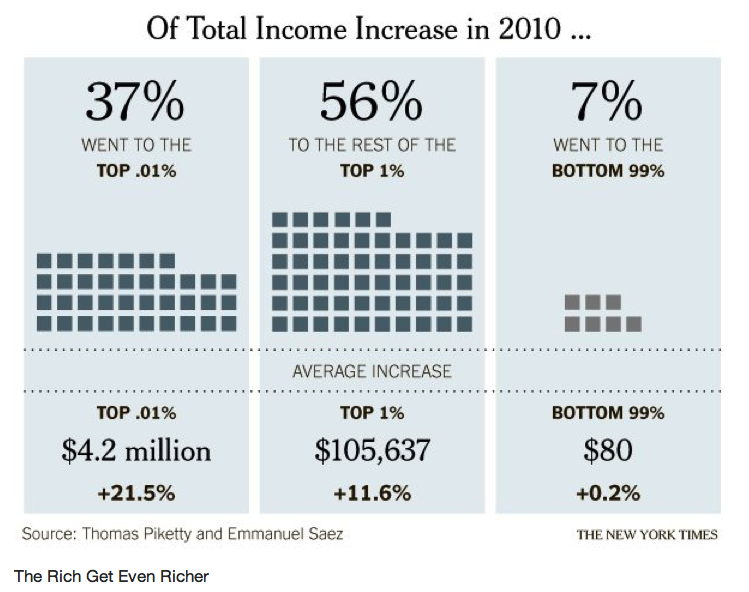 The following is how income gains in the United States were distributed during 2010…. #2 Back in the 70s, the top 1 percent earned about 8 percent of all income. Today, they earn about 21 percent of all income. #3 The wealthiest 1 percent of all Americans own more wealth than the bottom 95 percent combined. #4 According to Forbes, the 400 wealthiest Americans have more wealth than the bottom 150 million Americans combined. #5 The poorest 50 percent of all Americans collectively own just 2.5% of all the wealth in the United States. #6 Median household income in the United States is down 7.8 percent since December 2007 after adjusting for inflation. #7 The top 0.01% of all Americans make an average of $27,342,212. The bottom 90% make an average of $31,244. #8 According to the Economic Policy Institute, between 1979 and 2007 income growth for the top 1 percent of all U.S. income earners was an astounding 390 percent. For the bottom 90 percent, income growth was only 5 percent over that same time period. #9 According to one study, between 1969 and 2009 the median wages earned by American men between the ages of 30 and 50 dropped by 27 percent after you account for inflation. #10 In 2010, 2.6 million more Americans descended into poverty. That was the largest increase that we have seen since the U.S. government began keeping statistics on this back in 1959. #11 According to the New York Times, approximately 100 million Americans are either living in poverty or in “the fretful zone just above it”. #12 According to Heidi Shierholz, an economist with the Economic Policy Institute, about 53 percent of all income went to the middle class back in the 1970s, but today only about 46 percent of all income does. #13 When you look at the ratio of employee compensation to GDP, it is now the lowest that is has been in about 50 years. #14 In 1970, 65 percent of all Americans lived in “middle class neighborhoods”. By 2007, only 44 percent of all Americans lived in “middle class neighborhoods”. #15 Back in the year 2000, 11.3% of all Americans were living in poverty. Today, 15.1% of all Americans are living in poverty. #16 The poverty rate for children living in the United States increased to 22% in 2010. #17 According to the U.S. Census Bureau, 6.7% of all Americans are living in “extreme poverty”, and that is the highest level that has ever been recorded before. #18 According to the U.S. Census Bureau, the percentage of “very poor” rose in 300 out of the 360 largest metropolitan areas during 2010. #19 Back in 1950, more than 80 percent of all men in the United States had jobs. Today, less than 65 percent of all men in the United States have jobs. #20 The average duration of unemployment in the United States is nearly three times as long as it was back in the year 2000. #21 In the United States today, there are 240 million working age people. Only about 140 million of them are actually working. #22 Back in 2001, the ratio of wages to GDP was sitting at approximately 49 percent. Today, it has fallen all the way down to about 44 percent. #23 Half of all American workers now earn $505 or less per week. #24 Back in 1980, less than 30% of all jobs in the United States were low income jobs. Today, more than 40% of all jobs in the United States are low income jobs. #25 In 2010, 19.7% of all U.S. working adults had jobs that would not have been enough to push a family of four over the poverty line even if they had worked full-time hours for the entire year. #26 Electricity bills in the United States have risen faster than the overall rate of inflation for five years in a row. #27 The average American household spent a staggering $4,155 on gasoline during 2011. #28 If inflation was measured the exact same way that it was measured back in 1980, the rate of inflation in the United States would be well over 10 percent. #29 According to a recent report produced by Pew Charitable Trusts, approximately one out of every three Americans that grew up in a middle class household has slipped down the income ladder. #30 Total student loan debt in America has now passed the 1 trillion dollar mark, and about 270 billion dollars of those loans are at least 30 days delinquent. These debts are absolutely crushing young middle class families. #31 Today, approximately 25 million American adults are living with their parents. #32 According to the Census Bureau, 49 percent of all Americans live in a home that gets direct monetary benefits from the federal government. Back in 1983, less than a third of all Americans lived in a home that received direct monetary benefits from the federal government. #33 Between 1991 and 2007 the number of Americans between the ages of 65 and 74 that filed for bankruptcy rose by a staggering 178 percent. #34 One out of every six elderly Americans now lives below the federal poverty line. #35 The number of children living in poverty in the state of California has increased by 30 percent since 2007. #36 According to the National Center for Children in Poverty, 36.4% of all children that live in Philadelphia are living in poverty, 40.1% of all children that live in Atlanta are living in poverty, 52.6% of all children that live in Cleveland are living in poverty and 53.6% of all children that live in Detroit are living in poverty. #37 In November 2008, 30.8 million Americans were on food stamps. Today, more than 46 million Americans are on food stamps. #38 Right now, one out of every four American children is on food stamps. #39 It is being projected that approximately 50 percent of all U.S. children will be on food stamps at some point in their lives before they reach the age of 18. #40 In 2010, 42 percent of all single mothers in the United States were on food stamps. #41 Back in 1965, only one out of every 50 Americans was on Medicaid. Today, one out of every 6 Americans is on Medicaid, and things are about to get a whole lot worse. It is being projected that Obamacare will add 16 million more Americans to the Medicaid rolls. #42 Medicare spending increased by 138 percent between 1999 and 2010. #43 One out of every six Americans is now enrolled in at least one government anti-poverty program. #44 Federal housing assistance increased by a whopping 42 percent between 2006 and 2010. #45 The amount of money that the federal government gives directly to Americans has increased by 32 percent since Barack Obama entered the White House. As the middle class is systematically destroyed, families are looking for ways to survive any way that they can. Why do you think that dollar stores are absolutely thriving these days? It is because that is the only place many families can afford to shop. Well, many liberals claim that the solution is to tax the wealthy and redistribute their money to the poor. But that is definitely not the answer. That would give the wealthy more of an incentive to take their wealth and their businesses out of the United States, and it would give the poor more of an incentive to sit around and not work. When I was younger, if I could have gotten the government to pay my bills I probably never would have worked at all. I was quite lazy and I probably would have been more than happy to sit at home and collect government checks. It is only human nature not to work hard when you have someone else willing to take care of you. For example, Vice-President Joe Biden recently revealed that he stayed in the U.S. Senate for so long because he didn’t want “a real job“. There is a part of all of us that would like to avoid hard work. So redistributing wealth is not going to be good for society as a whole. It penalizes being productive and it rewards being lazy. And our tax system is already way too oppressive for those that honestly pay their taxes. Did you know that the average American must work 107 days just to make enough money to pay their taxes? That is before a single penny is earned for anything else. This year, the average American will spend approximately 29 percent of what they make on federal, state and local taxes. No, the truth is that our current tax system is horrific and it needs to be thrown out. But that is a topic for another article. Getting back to the dying middle class, the real answer is to break up big government and to break up the big corporations and promote competition in our economy once again. We need wealth and power to be spread out into millions and millions of hands. We need a system that tremendously encourages small businesses instead of absolutely crushing them. We need dozens of competitors in most industries instead of just a handful. We need to empower average Americans to be their own bosses instead of being dependent on big government and big corporations. We need a system that gives “the little guy” a fighting chance. It could be done if the American people were willing to reign in big government and the big corporations. If you believe in the U.S. Constitution, you should believe in limiting the power of the federal government and limiting the power of the big corporations. Those are principles that our founding fathers believed in, and those are principles that we need to return to.